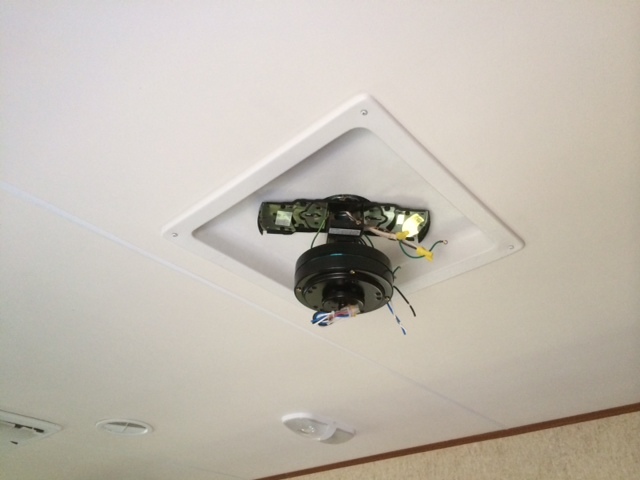 Although the ceiling fan installed in our trailer was still working OK, it was puny, didn’t put out much air circulation, was a bit plain looking and the light didn’t put out much light. Since Hunter ceiling fans were on sale at Lowes, we picked out one we liked and purchased it. Here is somewhat of a step-by-step installation. This How-To assumes that you already have a ceiling fan installed and that you are changing it out. 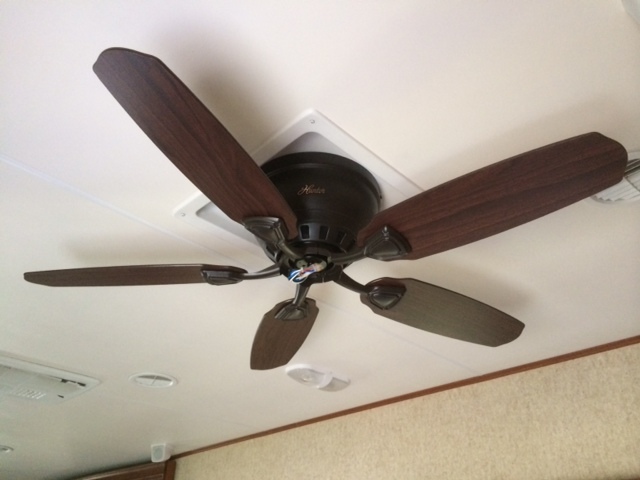 When shopping for a new ceiling fan for your RV, make sure that the blades will clear any nearby obstacles if you purchase a larger fan. 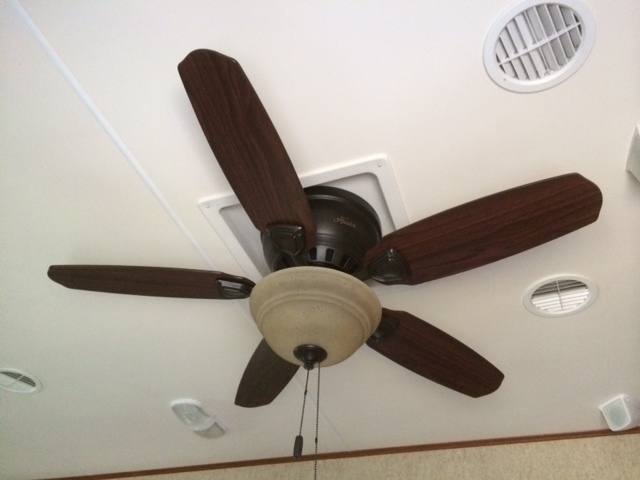 The fan our RV came with was a 42″ fan (measured from blade tip to opposite blade tip). The nearest obstacle for ours was a nearby ceiling mounted speaker. The existing blades cleared it by about 6 inches, so a 52″ fan would work (pretty much the largest standard household fan commonly available). Another factor is to make sure that the fan blades will clear any slideouts. The tops of our slideouts are more than a foot below the ceiling, so even though our replacement fan wasn’t quite as low profile as the original fan, it still clears our slideouts with ease. If your current fan’s blades are close to the slideout top, make sure that the replacement fan is pretty low profile. Worst case, you’ll have to disassemble it, repackage it and take it back. We started by disassembling our fan. Most ceiling fans are pretty standard in the type of assembly. Removing the globe from the light kit usually opens up the rest of the fan to where you can figure out what to remove next. In our case, Malcolm removed the four fan blades, then the decorative cover over the motor assembly, then the motor assembly from the mounting bracket, then the mounting bracket. Our old fan with globe and bulb removed. At some point, you’ll have to disconnect the power wires from the existing fan. If you feel uncomfortable doing this with power still being supplied to your RV, you can go out to the pedestal and turn off the main breaker. Malcolm untwisted each wirenut in turn, pulled the fan wires off the feed wires and replaced the wirenut on the feed wires. Wiring-wise, you’ll find a wire with black insulation (the hot wire), a wire with white insulation (the common wire) and a bare wire or one with green insulation (the ground wire). Your replacement fan will indicate how to wire everything back up using those three color codes (this is all standard 110V wiring). Everything removed, wiring hanging down and capped. 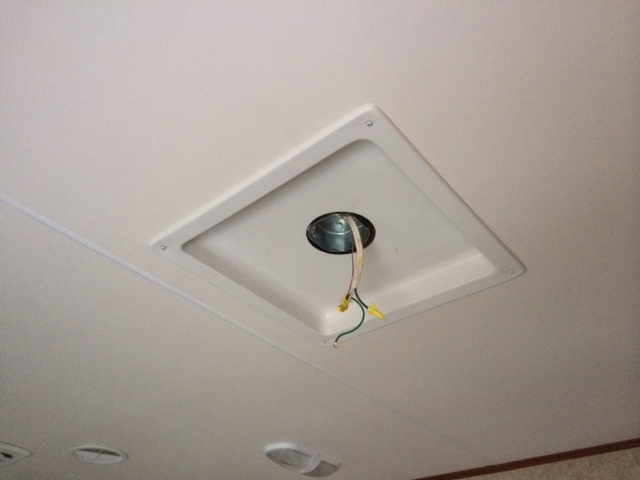 There is a standard fan-ready junction box located above the white ceiling panel, and we found that the mounting bracket that came with our new fan screwed right onto it with no problem. From this point on you will want to follow the instructions that came with your fan to assemble it correctly. We’ll show you how our Hunter fan (the Louden model) went together. After mounting the bracket to the junction box, the motor assembly slides into the center of the bracket and two screws keep it from sliding out, but leave it enough wiggle room to soak up vibrations. Malcolm wired up the new motor to the existing feed wires coming through the ceiling according to color code, re-using the yellow wirenuts that were on the wires to start with. The fan came with new wirenuts, but the existing ones were still in good shape and grabbed the wires just fine. If in doubt, use the new ones if they come in the fan kit. With the motor wired up, Malcolm installed the decorative cover with the screws provided. Tightening the set screws was a job for a pair of pliers since the top of the base is inset up into the plastic bezel in the ceiling. Next, the fan blades were mounted on the motor. Motor, shroud and blades all mounted. The light kit mounts up to the bottom of the motor assembly. The motor assembly and the light kit had matching plugs to connect all the wiring together. That was mounted and tightened down, the lights installed and the shade put on. Make sure both the pull chains are fed through anything needed to get them down where you can turn things on and off. The first test of our fan had the light working fine, but the fan spun about 1/4 turn and stopped. 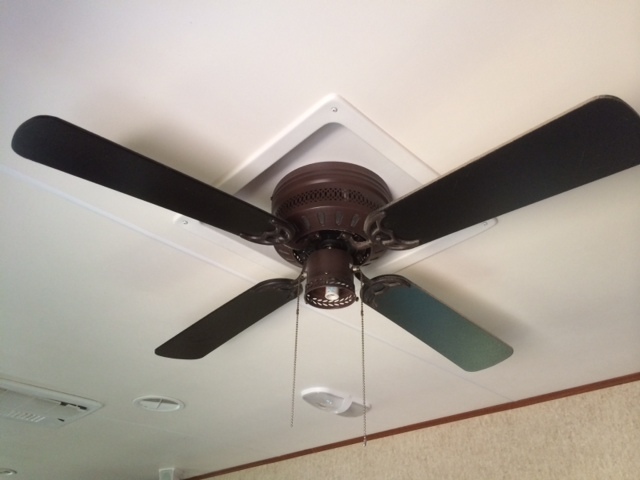 Malcolm found that he had mounted the light kit a little bit askew and one of the screws holding it together was protruding into the path of the fan blade mounts. He fixed that (a little disassembly and reassembly) and the second test was a success. Our fan is just a tiny bit out of balance. It came with a balance kit that Malcolm started to play with but decided to put off for another time. It’s not so far out of balance to cause any immediate issues. I have not been particularly pleased with our ceiling fan either. OK but not great. Will be at Lowes tomorrow for a non rig project. You have inspired me and I will start looking. It is great that you try to point out all the catches and glitches that you can.